*1: If a Maintenance Minder message does not appear more than 12 months after the display is reset, change the engine oil every year. *4: Driving in mountainous areas at very low vehicle speeds results in higher transmission temperatures. 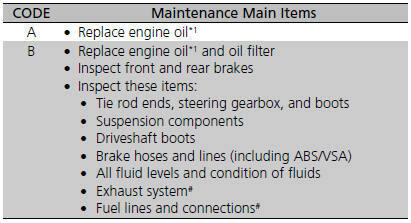 This requires transmission fluid changes more frequently than recommended by the Maintenance Minder. If you regularly drive your vehicle under these conditions, have the transmission fluid changed every 25,000 miles (40,000 km). 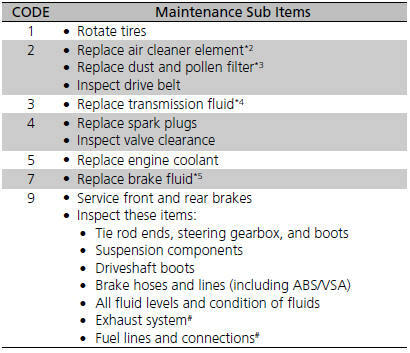 *5: If a Maintenance Minder Indicator does not appear more than 36 months after the display for item 7 is reset, change the brake fluid every 3 years. Inspect idle speed every 256,000 km (160,000 miles). Adjust the valves during services A, 0, 9, 1, 2, or 3 if they are noisy. *2: If you drive in dusty conditions, replace the air cleaner element every 24,000 km (15,000 miles). *3: If you drive primarily in urban areas that have high concentrations of soot in the air from industry and from diesel-powered vehicles, replace the dust and pollen filter every 24,000 km (15,000 miles). This requires transmission fluid changes more frequently than recommended by the Maintenance Minder. If you regularly drive your vehicle under these conditions, have the transmission fluid changed every 40,000 km (25,000 miles).